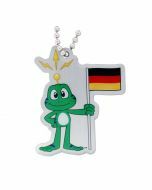 Where in the world is Signal the Frog®? Signal’s third stop: Australia! On Friday, January 26, it will be Australia Day! You can earn a souvenir by hosting or attending a geocaching event January 26th-28th. It doesn't have to be in Australia, but it will probably be more fun if it is! This impressive geocoin, designed by our very own Roxxy, truly has to be seen to be appreciated. It a very heavy coin with incredible detail and colors along with very fun layers of design. This geocoin is trackable at Geocaching.com with a unique icon. Measures approximately 2.6875 x 2 inches. 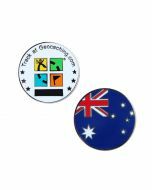 You're reviewing:Australia Day Geocoin- Where in the world is Signal the Frog®?